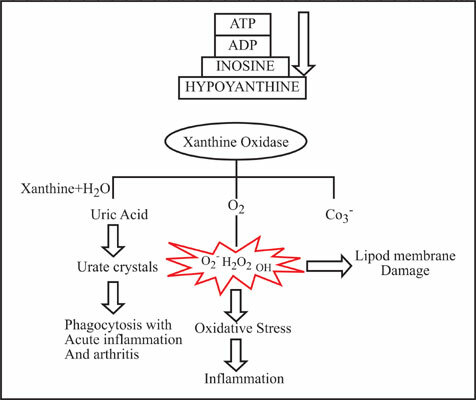 Background: Xanthine oxidase a ubiquitous enzyme has been found to be involved in various pathological disorders including gout, hyperuricemia, inflammation, oxidative stress and cardiovascular diseases. Inhibitors of xanthine oxidase thus find a crucial role in the therapeutic treatment of these deadly diseases. Objective: Considering the side effects of today’s treatment regimen here we choose nature based compounds to act as xanthine oxidase inhibitors. In the present work, we performed in-silico docking of natural compounds to reveal the underlying mechanism of inhibition of xanthine oxidase. Further filtration of screened compounds with ADMET studies has been performed. Method: An in-house library of natural compounds screened through ADMET profile for the drug likeliness property was approached for docking studies using Schrödinger suite. Calculation of docking score was done by glide module and free binding energy calculations were performed through MM/GBSA software. Keywords: Natural products, xanthine oxidase, virtual screening, MM-GB/SA, ADMET. Keywords:Natural products, xanthine oxidase, virtual screening, MM-GB/SA, ADMET. Abstract:Background: Xanthine oxidase a ubiquitous enzyme has been found to be involved in various pathological disorders including gout, hyperuricemia, inflammation, oxidative stress and cardiovascular diseases. Inhibitors of xanthine oxidase thus find a crucial role in the therapeutic treatment of these deadly diseases.